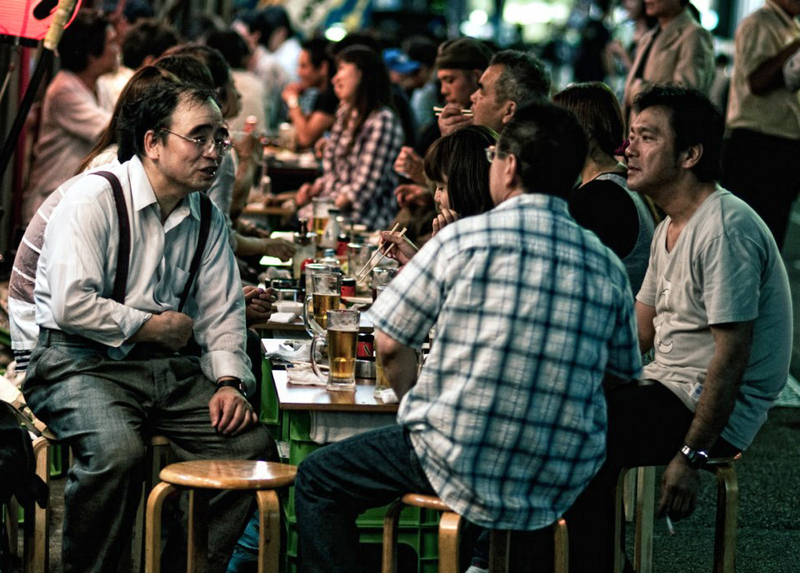 The source for this photo, GlobalVoicesOnline.org, says that in Japan, drinking can be a social obligation. 5 ounces of wine at 12% alcohol is 0.6 ounces or about 17 grams ethanol. 12 ounces of beer at 6% alcohol is 0.72 ounces or about 20 grams ethanol. 300 grams works out to 2.5 glasses of wine a day (a small glass: 5 ounces) or 2 glasses of beer a day (12 ounces). If you drank this amount or more, you were considered a heavy drinker. However, in the US, a heavy drinker (from the US Cancer Prevention Study) was someone who consumed more than 30 g of alcohol per day, so more than 9 ounces of wine (a little less than 2 glasses) or 1.5 beers. That about 3.5 small (5oz) glasses of wine or 3 (12oz) beers a day. That was the riskiest. That’s telling. It says that if you drank less than 2 drinks a day, you didn’t experience increased risk, in this study at least. I imagine that future guidelines for alcohol consumption in the US will address frequency as well as amount, incorporating “three alcohol-free days a week” into the “1 drink for women and 2 drinks for men” advice. … As long as the wine, beer, and spirits lobbies don’t nip it. This entry was posted in Alcohol, Beer, Cancer, Wine on May 22, 2014 by Bix.